I use Google Alerts to help me find Firestorm-related content on the web. Typically the alerts are full of useless news articles citing a “political firestorm in Washington DC”, or some ridiculous “celebrity social media firestorm”. But every once in a while I come across some completely bizarre Firestorm-related gem. When I found this one, I simply couldn’t pass it up! There is a website called NLSC (NBA Live Series Center) that is dedicated to covering basketball video games. On their forum someone has started a Marvel vs DC basketball topic. This thread includes images of Marvel and DC characters playing basketball. 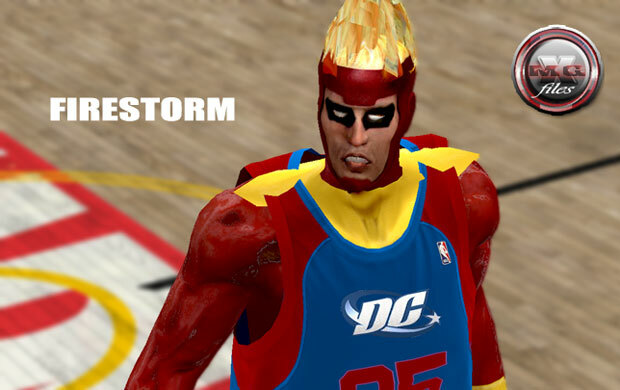 A forum member who goes by “MGX” posted an image of Firestorm in NBA gear! Check it out below! Considering Ronnie played basketball throughout high school, this seems pretty fitting! Now this next part is the AMAZING bit! Someone has taken these custom skins for the game and created a video! Firestorm even appears! DC vs Marvel Basketball! Enjoy! This is awesome! I happen to have the game…maybe I need to look into getting a new team! @Patrick – Glad you dug it! I can’t tell you how many times I’ve watched this video. I keep getting sucked in by it! Too fun!